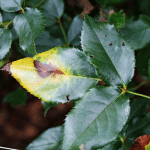 I have just deadheaded my roses and observed one bush with yellowing leaves. I don't see insects. What kind of treatment and fertilizer do you recommend? I have been using Bayer Advanced 2in 1 systemic Rose and Flower Care.i know it's time to fertilize again. I live in central CA between Bakersfield and Fresno. We've had a wonderful spring but hot weather will be here very soon. Thank you for your help. Some of what is shown is from either water or a spray of some kind sitting on the leaf structure too long. The water sitting on the leaves too long acts like a magnifying glass and burns the leaf tissues. Thus the brown spots with yellow around them at the highest moisture retaining spots, then going to more yellow, then brown. Once the tissue damage has been done there is little that can be done to stop it. I prune off the entire leaf set back to the cane. Take a look at your watering system, or if you hand water like I do, the time of day which watering is done. I suggest watering in either the early morning so any water on the foliage has time to dissipate before the suns rays get intense or early evening once temps have started to cool.